This very active small honeyeater (about 13–14 cm) has a distinctive long downcurved bill used for probing flowers. It occupies a wide range of habitats from eucalypt forest and rainforest to parks and gardens. It is mostly a winter visitor to the lower altitudes of the Samford district, coming down from the wetter forests of the ranges where most local birds seem to spend the summer, with some birds migrating from further south. The colourful plumage is a mix of chestnut/orange, white and black. The broad white tips of the outer tail feathers of are very noticeable in flight. The loud call is a rapid piping whistle. Sometimes the wings are used to make a ‘frrup frrup’ sound in flight. 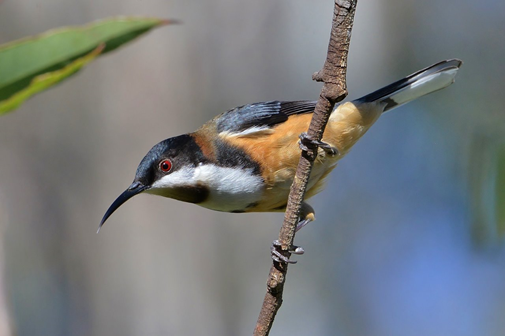 The Spinebill feeds mainly on nectar from trees and shrubs, but also hawks for insects or gleans for spiders. In the garden it loves bottlebrushes, smaller grevilleas and any native nectar-producing flowers with a tubular structure.